British Airways is on the verge of rolling out a trial of a pre-order food service, Business Traveller reported last week. This will allow passengers in Club World and First to specify their choice of meal in advance and be guaranteed to receive it. At present, non-status customers can find that their first choice of meal is not available. This is NOT a version of the Singapore Airlines ‘Book the Cook‘ service. Singapore allows you to pick from a substantial range of meals – there are 20 different main courses available for a First Class passenger departing London, including lobster thermidor – so you know that you will be getting something you want. The British Airways version, based on what has leaked out to date, will not be like this. My understanding is that it is effectively a cost-cutting move to reduce wasted food. You will only be able to choose from the standard menu for your flight. The airline will then be able to reduce the number of meals loaded for other passengers, reducing the chances that they will be able to have their first choice. Rather like pre-selecting seating, you are likely to find that you will HAVE to pre-select your meal – whether or not you like picking your food weeks in advance – because the chance of getting what you want onboard has shrunk. This leads to another question …. would pre-selecting your meal in Club World stop you being upgraded? 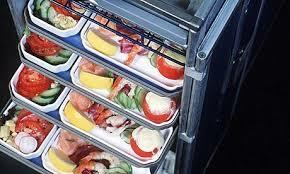 At present, it is BA policy not to upgrade passengers with a special meal request. If BA did allow you to choose a meal which was not on the on-board menu it would almost certainly block you from an upgrade. To be fair, we do not yet know the full details of this service so it could turn out to offer genuine benefits. Expect an announcement in the next few weeks. Sounds likethe American Airlines system. AA make menus available 30 day prior to the flight for on-line booking. I do like the AA system if not always their menu choices. It makes absolute sense, from a logistic point of view, to do this. I suppose the only problem will be passengers not choosing their menu. Sounds as if it will make sense NOT to choose in advance if you fancy your chances of an upgrade. I had a special meal ordered for my NY-LHR flight in June and, when I enquired about an ugrade at JFK, the lady offered it to me for $900. Clearly, I didn’t take her up on this, but it shows that it is possible. Maybe she would have made me a better offer had I not had a special meal, though! She probably didn’t notice. BA crew are not allowed to serve a meal, special or not, in a different cabin to the cabin it was originally ordered for. I was given a business class meal while in ecomomy while flying with BA after I got chatting to the flight attendant and found out we had something in common. I don’t know where you get that idea from Fee. I’m a GGL and I see blocked (i.e. occupied) seats on the seat map just like anyone else. There certainly isn’t an extra button for me to press to eject whoever got to my favourite seat first. I think only Premier members can do this. To be honest, I think BA needs to rethink the Premier concept. Most Prems control the travel budgets at big corporates. To keep ‘in’ with these people (who are just travel managers remember) they get cars to and from planes when connecting, can eject people from prepaid seats and get VIP service at every airport. Seems, to put it mildly, excessive. and possibly dangerous now that the UK has a Bribery Act. The AA service has been around for a while and works really well. This service from BA will be accompanied by marketing hyperbole that would have you believe it’s a first and unique when in reality it’s simply BA catching up. On AA the pre ordering has never stopped me changing my mind on board with the proviso that there are no guarantees. That said on two separate occasions I have changed my mind and the crew accommodated my choice. Still won’t get me into club world over either CX or AA on a paid basis, the need to change the seat for that to happen. If it does disallow you from getting an OpUp it could be irksome, but for 3 class cabins (and F flights) it sounds like a winner to me. how will this work with WTP. AIUI they currently get a CW meal after the CW customers have chosen. This is not correct, the WTP meals are separate although are the two mains are from the CW menu. I stand corrected. I always assumed that WTP got their choice only after the CW cabin got theirs. Flew AA twice last week (outbound was original flight, inbound was a flight change less than 24hrs before departure); on the outbound pre-selected my meal in the J cabin; at the gate was upgraded to F, so doesn’t seem to bother them. Only thing of interest – the F main courses were (on the whole) exactly the same as the J main courses – just the F was plated in the galley, whereas J was pre-plated. I’ve travelled some 15 times in BA First as Blue usingt Avios and each and every time have always got first choice starters and mains. In fact we’ve usually had our orders taken before any other passengers. I like to think it’s the fact that we are polite and friendly when we board. Ironically I got screwed over – despite my Gold card – flying to Dubai in F last October! I can confirm about not getting upgraded if you order a special meal. Since getting Gold I did several flights no upgrade. Then I unselected my usual seafood meal. Next flight I got the beep. Flying cattle class, the selection is usually “beef or chicken” in some form or other. When I went to Oslo in Business the other month, the choices were something with prawns and something with chicken. As I’m allergic to seafood, I went for the chicken, which was fairly poor. Same choice coming home, but I had to have the chicken again. If the choices are something you’re allergic to or anything else, they ought to at least pack more things people are less likely to be allergic to (seafood allergies are not utterly unheard of!). If you have an allergy to a specific food type or types, you should order a special meal to ensure you can eat it. Also, this is talking about longhaul where there are a few more options.